Perfect for those without a garden or who only have a small space to work with, or simply if you wish to bring some interest to a dull space, succulents love growing in pots. A potted succulent can really brighten up a balcony, patio, table or windowsill. They’re small, and easy to carry from house to house, or simply shift around for a changing look. It’s easy to choose the perfect size succulent for your pot with the InStyle Succulent categories. Simply select from the Small, Medium or Large category depending on the pot size, or Spreading if you want the plant to trail over the edges for a softened look. You can create an amazing look in your larger pots by mixing your succulents and layering different types with these size guides. We love the idea of using a “Thriller, Spiller and Filler” to cover all bases and make an impressive display. Choose different colours and textures and have fun! The Thriller adds height or drama, the Filler is a bit wider and fills things out, and the Spiller is a plant that has movement and will eventually spill out of the piece. Succulents in containers will require protection from extreme heat and cold. They will need a lightweight succulent potting mix that has a good component of sand, and there will need to be plenty of sunshine. You can buy a special “succulent mix” from any plant nursery. A sprinkling of pebbles on top will help give a neat finish and anchor any loose soil down. An occasional sprinkle or mist with water is all that’s needed to keep them hydrated, and this is best done in the warmer months. Treat your beauties to year round plant health with Seasol Pots & Plants. Unlike a fertiliser, it is a natural health tonic made from seaweed extract. One of its primary uses is to promote root growth, which is why it’s often used on more delicate plants. 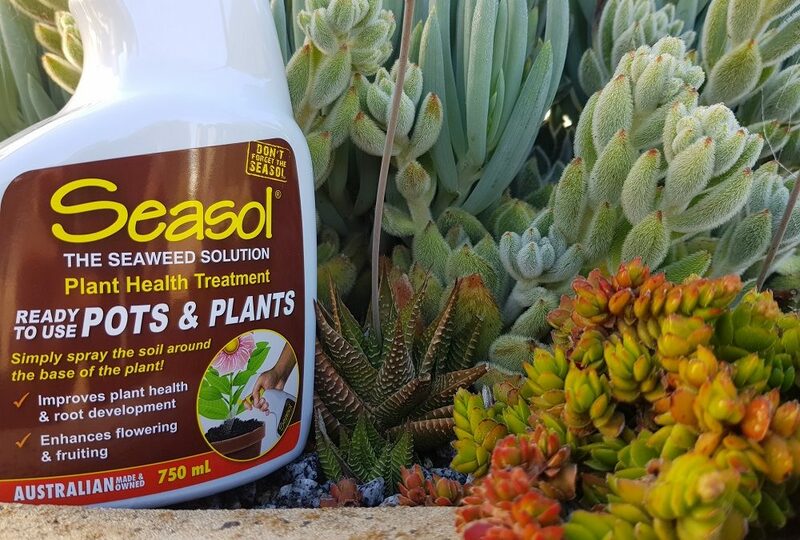 Seasol also plays a strong role in strengthening plant cells, so plants can withstand harsher environments longer before they wilt, burn, freeze or show signs of stress. The great thing about Seasol Pots & Plants is that it’s in an easy to use spray bottle, so can be applied directly to your potting mix, wherever the pot is sitting. As well as displaying stunning foliage colour, shape and texture, most succulents bloom with beautiful and unique flowers. Application of Seasol Pots & Plants will really make them sparkle! Succulents are a special addition to your garden and home, and sure to be a talking point. Gift one to your friends and family, or treat yourself to some succulent love.